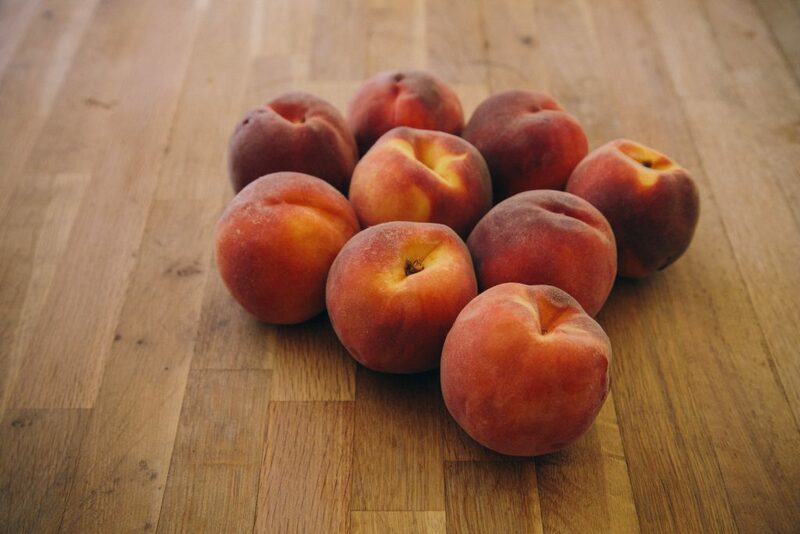 The peaches are lovely and round, ripe and redolent. They’re piled high on the fruit plate on our table in the morning and nearly gone by the evening. Why would we bake them when all four of us love a peach plucked from the tree? This. 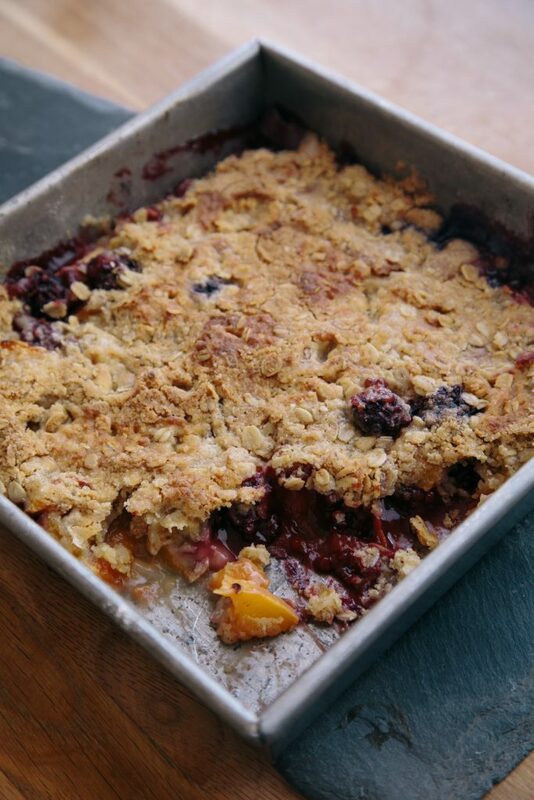 This gluten-free peach and blackberry crisp is why we turn on the oven in the afternoon. I love pies. Our entire family loves pie. We’re fine with cake — a good cake is a lovely surprise. But for pure comfort, we all turn to pie. Except Dan. He loves pie too, but he pretty much adores crisps. Perhaps it’s because they are the desserts his mother made him. Maybe it’s because crisps take less fuss to make than pie. Or it might be because a crisp is really about the fruit, not the fuss about the crust. Any way it happens, Dan loves a good warm crisp, made with the fruits ripe right now. This summer is where I figured out how to make a crisp he loves. And the three of us love it too. In fact, in the last three weeks of testing and re-making crisp to create the platonic ideal — sweet juicy fruit filling that is not too soggy, a topping made of flour and oats and brown sugar and butter, soft and holds together, not so brittle that you’re looking for any flake at all — we have not eaten any pie. No complaint from the peanut gallery here. This might be our favorite accompaniment to a summer’s evening, especially as we edge toward September, the light leaving earlier each day. Around 9 pm tonight, Dan and I will be on the couch, side by side, starting another episode of Stranger Things, and sharing a saucer full of this gluten-free peach and blackberry crisp. I hope you make this and share it with someone you love at the end of a summer’s day. We love pie around here. We’re all Team Pie in the Ahern household, including Desmond, who is only 2. Pretty much every weekend of the summer, I’m making a pie. Sometimes, however, a crisp is even easier. After years of making crisp, I found a template that works for me. 5 cup of fruit, a bit of honey, a bit of our gluten-free flour to thicken it, some salt. Done. 1 cup of our gluten-free flour, 1/2 cup of oats, some sugar, some cinnamon, butter worked into the flour. Done. My big change this summer? I work half the butter into the flour and dot the top of crisp with the rest. It results in a slightly crisper crisp. I love that. If you get serious about crisp, as we are here? Make up bags of crisp topping, cubes of butter included, in advance. Keep them in the freezer. Preheat the oven, chop up the fruit, and take the crisp topping out of the freezer. Dessert in 40 minutes. Prepare to bake. Heat the oven to 400°. Line a baking sheet with parchment paper. Grease an 8-inch square baking pan. Make the fruit filling. Combine the chopped peaches, blackberries, honey, flour, and salt in a large bowl. Make the topping. In a large bowl, whisk together the gluten-free flour, oats, brown sugar, cinnamon, and salt. Add half the cubes of butter. Using your hands, work the butter into the sugar until the butter is broken into the size of peas. Move the fruit filling into the baking pan. Strew the topping onto the fruit filing. Add the remaining butter cubes over the top of the filling. Put the baking pan onto the prepared baking sheet. Bake the crisp. Bake the crisp until the filling is hot and bubbly and the topping is brown and warm, about 30 minutes. Cool for 15 minutes before serving. Feel like playing? You can use this as a template for any fruit crisp you want to make. This weekend we’re making one with 3 cups of sliced new-crop apples and the blackberries before they are entirely gone. If you cannot eat dairy, you use shortening or coconut oil in place of the butter.